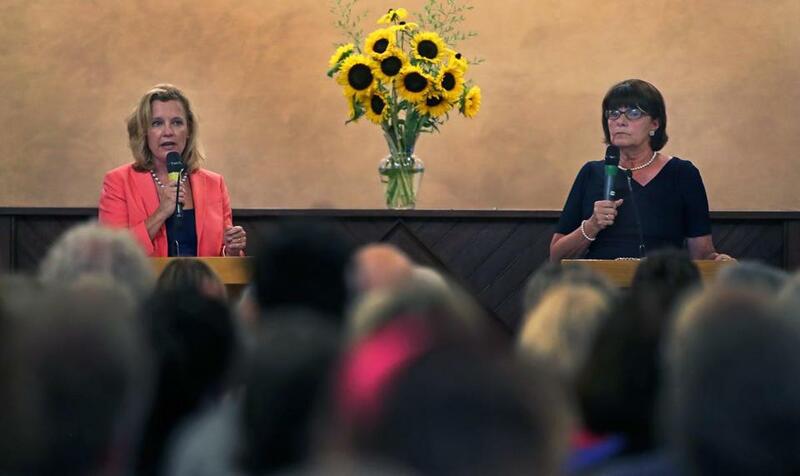 Middlesex County District Attorney Marian Ryan (right) and challenger Donna Patalano during a debate held at the First Parish Church in July. Ryan said she plans to release in October racial data being studied by the American Institute of Research. On issues like limiting cash bail requests, she said she has avoided detailed directives because she wants her prosecutors to use their discretion. She said her commitment to concrete change is evident in the landmark criminal justice bill the Legislature passed earlier this year. When other district attorneys signed a letter opposing early Senate versions of the bill, Ryan, along with Northwestern District Attorney David Sullivan, refused to sign on. State Representative Sean Garballey, an Arlington Democrat, said Ryan helped him write sections of the bill on restorative justice that became law. Adam Foss, a former Suffolk prosecutor who worked with Patalano when she ran the Suffolk District Attorney’s Office of Professional Integrity and Ethics, said Patalano began talking about prosecutorial reform years before it became mainstream. Over the years, Ryan has been far more receptive to criminal justice reforms than her peers, but she has also faced fierce criticism for her office's handling of several high profile cases. In 2015, a judge found that Middlesex prosecutors withheld exculpatory evidence in the case of an Irish nanny accused of killing an infant in her care. Last year, Ryan, then head of the state district attorneys’ association, said district attorneys were working to notify thousands of defendants whose drug cases could have been compromised by Sonja Farak, a lab chemist who admitted she was under the influence of drugs when she was testing evidence between 2005 and 2013. Ryan made the announcement after the American Civil Liberties Union had sued her and other prosecutors for taking too long to identify potentially compromised cases. In April, a Supreme Judicial Court justice ordered the dismissal of more than 7,500 cases. Ryan said the delays in her county occurred in part because her office would receive cases identified by numbers, not defendants’ names, from the state lab. Patalano has also criticized Ryan for what she describes as a heavy-handed management style that has hurt morale and led to high turnover rates. The turnover means police officers must spend overtime hours briefing new prosecutors on cases and victims must tell their stories all over again, said two longtime Middlesex prosecutors who recently quit. They said they left largely because they felt pressured to run nearly all matters by their supervisors, who often told them to seek higher bails and tougher sentences than they felt were justified. “I don’t know one senior prosecutor in that office who isn’t looking for another job,” said one of the former employees, who spoke on condition of anonymity because they work for state agencies. Ryan said the high departure rate is due, in part, to the size of the county, which requires prosecutors to have a car. Many prosecutors, faced with low salaries and student loans, cannot afford one, Ryan said. Ryan said the office has several layers of supervision and prosecutors are encouraged to be open with their managers. “I hire bright, well-educated people who are encouraged to speak their minds,” Ryan said. Ryan questioned why other district attorneys in the state, all of whom are male, are seldom criticized by former employees. Patalano has also faced criticism for her management decisions. When she was chairwoman of the state’s Board of Bar Overseers, which investigates complaints against lawyers, Patalano was tasked by the Supreme Judicial Court with reviewing the benefits the office’s employees received. In 2016, she announced sweeping cuts to longstanding benefits, a move that spurred staff members to unionize. Patalano described that time as “the hardest” of her professional career and conceded the employees should have had more say in the outcome. “If I could do it over, I think we would have included their voice in the conversation,” Patalano said. Patalano twice considered working for Ryan, in 2015 and 2016. Ryan’s campaign gave the Globe e-mails in which Patalano described her excitement at the prospect of working in the office. She was offered jobs both times, but declined, saying she was looking for a position with more leadership responsibilities. Now, Patalano says she was just being polite. “That was when I really started thinking of running for the office,” she said.